For those of you who love books just as much as paper jewelry, here's a winning combination... a dear set of antique book necklaces. Margaux Kent of Philadelphia and Etsy shop, The Black Spot Books, sources the leather covers from vintage wallets, doctor's bags, sofas, and chair covers. She uses Strathmore acid-free drawing paper for the pages and sews them by hand with linen binder's thread. Margaux's tiny journals are also stocked at an impressive list of places...The Library of Congress, Anthropologie, and the ever so quirky Mütter Museum in Philly, to name just a few. In addition to book necklaces, she enjoys creating all sorts of unusual things from "olde things, treasures found and recovered from misfortune and neglect, relics of the unusual, the confused and the macabre..." I marvel at people who write and reimagine the old into new the way Margaux does. All Things Paper Facebook Finds from the past week... and oh, there are some good ones! There's still time to enter the Botanical PaperWorks giveaway ($25 gift certificate to spend in their online store and a coil bound eco-calendar). Ends Sunday; U.S. and Canada residents. 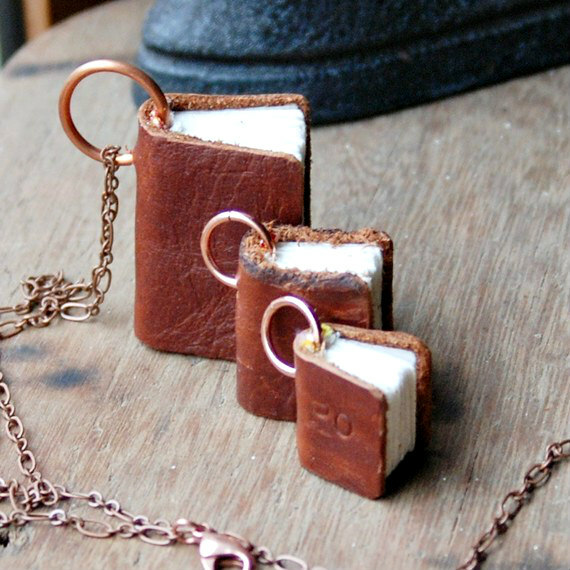 Really adorable antique book necklaces!! The mystery book sculptures are by a woman ,how nice and the dinosaur looking so ferocious, hard to believe these are her very first works. these are SO ADORABLE!!! just another reason to miss philly! oooh new interview with yulia?? off to click on these facebook find links! I'm sorry the mysterious Edinburgh sculptor is stopping at 10. I have loved following the story. Those journals are a lovely bit.